Pilots of army aviation started practising helicopter landing and take-off in mountainous terrain in the Erebuni Russian aviation base in the Republic of Armenia. More than 50 pilots of Mi-24P attack and Mi-8MT transport-attack helicopters are involved into training flights. Landing and take-off practising of higher complexity is carried out at both day and night at grounds of Aragats mountain located at the altitude of 1.5-3.5 thousand metres above the sea level. Apart from landing in mountains, pilots are practising flying at maximum low altitude above difficult landscape and mountain rivers, searching and monitoring simulated enemy columns, cooperating with motorized rifle units while carrying out counter sabotage tasks at high mountain Kamhud and Alagyaz ranges. Moreover, flying around the territory of Russian unit location in the South Caucasus to check its radio electronic armament, air defence complexes, systems of communications and aviation control. March 13- Mi-8MT helicopter pilots and operators of the Russian military base in Armenia started training in mountainous areas. The training is held day and night in different weather conditions under supervision of experienced instructors. The pilots will perform different piloting elements and landing on restricted areas. They will also practice operating the helicopters in conditions of limited visibilitywith usage of navigation systems. The special attention is paid to operating the hardware in mountainous areas. Turkish media appears to be ill at ease over the creation of a Russian-Armenian system of a regional joint air defense, suggesting that the agreement could mean trouble for Ankara and lead to growing instability in the region. On Wednesday, Russian Defense Minister Sergei Shoigu and his Armenian counterpart Seyran Ohanyan signed an agreement on the creation of a joint regional air defense system for the Caucasus region. The agreement was one of several CIS Defense Ministers’ Council cooperation plans for 2016 inked in Moscow, with negotiations ongoing for regional air defense agreements with Kyrgyzstan and Tajikistan. A joint air defense agreement was reached between Russia and Kazakhstan in 2013, Moscow recently handing a S-300 SAM platform over to Astana. Russian and Belarusian air defense systems have already been unified. Armenia hosts two Russian military facilities, including the 102nd Russian Military Base, located in the northern city of Gyumri. Operating under its aegis is the joint-basing airfield at Erebuni, about 120 km north of Yerevan. According to open sources, the two bases are believed to hold between 4,000-5,000 Russian personnel.Earlier this month, the Erebuni base was reinforced with six Mi-24P assault helicopters, along with several Mi-8MT transport helicopters. Two weeks earlier, seven Mi-24s and several Mi-8MTs were deployed to the base. Commenting on the Russian-Armenian agreement, Turkish English-language media worriedly hint that it could be connected to Turkey’s downing of a Russian Su-24M bomber over Syria last month, as well as the presence of US bases in the country. Speaking to the paper, an anonymous official said that “Russia and Armenia [need] to abstain from actions that would jeopardize regional peace in the Caucasus,” with Ankara fearing that “Yerevan’s attitude would boost the risk of clashes in the region,” presumably referring to intensifying clashes between Armenia and Azerbaijan over the contested Nagorno-Karabakh region. For its part, the official suggested, Ankara is in favor of continuing with its ‘good neighbor relationship’ in the Caucasus. Turkey’s ‘zero problems with neighbors’ policy has been seriously strained in recent months by President Recep Tayyip Erdogan’s apparent ambitions for regional hegemony, from his support for anti-government militants in Syria, to the shootdown of the Russian Su-24 last month, to Turkey’s illegal intervention in northern Iraq earlier this month. MOSCOW, December 21. /TASS/. The Russian air base in Erebuni in Armenia has received a new batch of six helicopters, the press office of Russia’s Southern Military District reported on Monday. “Six modern Mi-24P attack and Mi-8MT transport army aviation helicopters have been delivered from a military field in the Krasnodar Territory,” the press office said. “A squadron of army aviation helicopters has been established in the Russian unit in the Trans-Caucasus and work is under way to assemble aviation transport means,” the press office said. The helicopters will stay on temporary suitable sites of the military aerodrome until the construction of organic helicopter pads, the helicopter base and service infrastructure is completed. The flights of Mi-24P attack gunships and Mi-8MT transport helicopters will start in the first quarter of 2016, the press office said. The Russian air base in Armenia received 7 Mi-24P attack helicopters and Mi-8MT transport rotocraft earlier in December. The air base at the Erebuni aerodrome in Yerevan was established in 1995. Russia’s MiG-29 multipurpose fighter jets were delivered to Armenia in 1998. In 2001, the units based in Erebuni formed the basis for the air base, which became the air component of Russia’s 102nd military base in Gyumri. Seven of Russia’s advanced Mi-24 Hind attack helicopters and Mi-8MT Hip transport helicopters have been deployed to a Russian air base in Armenia, the Southern Military District (SMD) said Tuesday. An additional batch of helicopters is expected to reach the base by the end of the year, the SMD said. 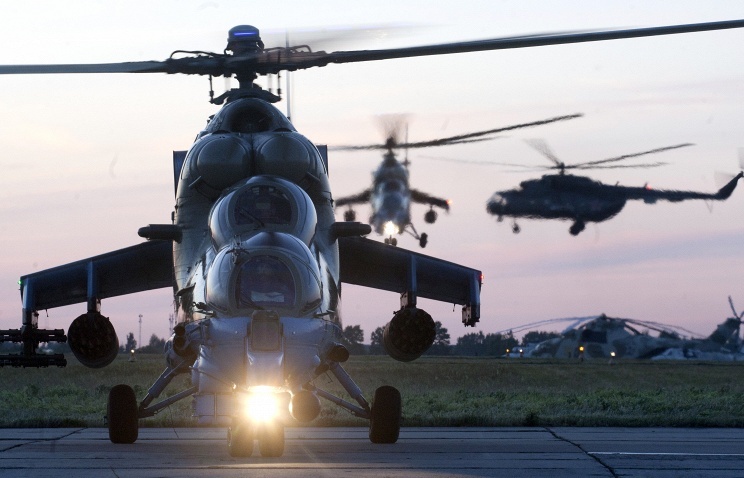 “The Russian air base Erebuni [Armenia] received a batch of modern helicopters – Mi-24P attack and Mi-8MT transport [helicopters],” SMD’s press service said. The helicopters will sit alongside the MiG-29 fighters at the air base, the SMD said, adding that pilots would begin helicopter flights in a month.The district’s Erebuni base was formed in 1995 and the MiG-29 Fulcrum multirole fighters were deployed there in 1998, according to the Russian Defense Ministry. In July 2001, the units at Erebuni were incorporated into an air division of the Russian 102nd Military Base in Gyumri, Armenia.